I suppose it must be the upset..... You know, Flopsy Girl going in for her teeth doing, and then being very quiet.... Anyway, the long and short of it is, I started to blow up a bit overnight, so the 2-foots made me have some medicine this morning UGH! Dandy, Gin and myself are crossing our ears and little paws for you to recover very quickly. Flopsy is back now. You don't need to worry anymore. All the best. Hello Dandybun it's Bobbin here. 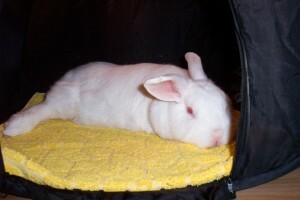 Hopefully the medicine will work very soon and you will be able to have snuggles with Flopsy Girl. Ah, sympathy pains! It's a male bun thing. I think the male 2-foots also suffer from this sometimes. Cheer up, Dandy! You'll be back to binkying soon since you trained your 2-foots so well to quickly give you the medicine.